It was clear from the beginning of my farming internship at Chubby Bunny Farm that my boss, Dan Hayhurst, loved the work of growing vegetables. Most mornings I would be lying in bed, just waking up around 6:30 am, and I’d hear his truck roll up to the barn. I’d listen as Dan got out and started hauling sacks of feed out of the barn to drive out to the small flock of chickens and few pigs on pasture. This was my cue to get up and stumble about my trailer, putting on filthy work pants and shirt, probably mildly hungover, quickly frying eggs and making coffee so I could meet him and my co-interns in the greenhouse or at the tailgate of his truck in time for the morning meeting. I knew he’d been up for hours thinking on the farm, planning the most efficient way of doing all the days’ many tasks, and it was barely 7 am. During the two non-consecutive seasons I spent at Chubby Bunny, Dan was with us each day, all day long. Whether we were hoeing, transplanting, harvesting, pounding posts for tomatoes, laying down mulch or countless other tasks, Dan was working right along side us. He started the days before we did, usually worked through lunch and often stayed in the fields after he’d sent us back to our intern trailers for the day. I am convinced that Dan’s constant presence in the field is a large part of whatever it is that makes me a halfway decent farmer today. If I had a question, and I often did knowing nothing about farming when I started that first season, Dan would gladly talk it all out until I was satisfied. I would learn over the next few years as a farm intern that the love I once witnessed in Dan is integral to the success of farming operations all over the world. I didn’t know until my second season, on Blue Fox Farm in the Applegate Valley of Southern Oregon, that it can be a little extraordinary to work alongside your farm boss every day, all day long. I remember wondering just exactly what Chris Jagger of Blue Fox and later, David Van Eeckhout of Hog’s Back Farm in Arkansaw, WI, were doing all of those hours when they weren’t in the field working side by side with me. I didn’t yet understand how many emails there were to return, bills to pay, supplies to order, crop records to fill in, newsletters to write. Not to mention tractor work to do that I didn’t yet have the skills to accomplish. All three of these farmers and their respective operations are known locally for their quality produce, and I am frequently grateful to have participated in their cohesive and very different farm organisms (and for their behind the scenes but equally hard-working wives, Tracy, Melanie and Melinda respectively). I believe learning the production aspect of farming is best done by actually farming. To me it’s the only way to understand all the many parts that must be coordinated and captured and synched together to become a gigantic and often frantic whole. 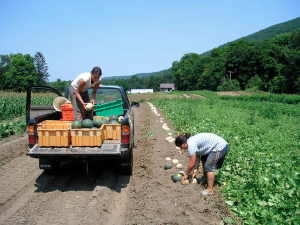 During the winter of 2012-2013 I enrolled in Farm Beginnings, a farmer training program which focuses entirely on non-production aspects of the business. We met every other weekend at Angelic Organic s Learning Center in Northern IL. The class covered, among other things, budgeting, cash flow, marketing, human resources, legal aspects, business structure, and strategic planning. Many of the presenters were area farmers who used examples from their own farms, the others were professionals working with farmers. I walked away with a much more well-rounded understanding about small farm ownership than I’d had going in. 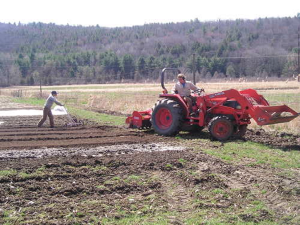 Farm Beginnings originated at the Land Stewardship Project in Minnesota, but today there are nine other programs around the country. Additionally, the MOSES conference in LaCrosse, WI is the largest organic farming conference in the country, and always full of knowledgeable presenters. But every time I go to the conference I walk away thinking the most important activity is talking to other farmers from all over the country, and reconnecting with those I haven’t seen in a while. Wisconsin is jammed with organic farmers, and I’ll take any opportunity to talk with them about what equipment they use, what crops they grow and how they approach the challenges we each face. There are many nearby farms to tour (possibly my favorite activity on Earth which I know makes me a huge nerd), farmer friends to call for an opinion, and (more so in the off season) potlucks to attend for celebrations and commiserations. The open exchange of information has always been one of my favorite aspects of sustainable agriculture, and I’m happy to be able to continue to learn from my fellow farmers.